Long March-7 rocket and Tianzhou-1 cargo spacecraft are seen as they are transferred to a launching spot in Wenchang, Hainan province, China (April 17, 2017). The Tianzhou cargo ship may not grab headlines, but it’s another step forward in China’s long-term space plan. Most Western analysts attempt to understand China’s space program through the lens of a Cold War “Space Race” principally about global prestige. Rather than just an arena for conquest and showing off, China seems to view space completely differently — as an environment in which to live, work, and create wealth through habitation and resource extraction. This different view of what space is directly affects policy. What is different about China’s space program is its direct tie to Beijing’s overall plan for national economic development. 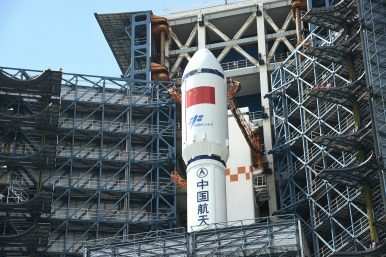 Rather than choosing missions based on the criteria of showmanship and prestige, China’s choice of missions seems targeted at long-term wealth creation through step-by-step accumulation of capabilities enabling it to access and extract space resources such as metals, helium 3 (fusion fuel), and Space Based Solar Power (SBSP). In this light, China’s first indigenously built Tianzhou cargo ship, which is being launched between April 20 and 24, is a major accomplishment. It will allow independent, indigenous, and unmanned access to the envisioned 2022 China space station for logistic deliveries. Perhaps even more important is its capability to conduct in-orbit refueling, which matures a general capability that extends access and logistics lines. Autonomous cargo delivery and in-orbit refueling are critical building blocks of an end-to-end supply chain for presence and space resources, or the construction of on-orbit power stations. Autonomous re-supply was a critical ingredient for the success of the International Space Station (ISS). Removing humans from a cargo delivery maximized the amount of cargo each ship delivered and lowered the burden to produce as well as removed the risk to astronauts. For a time, only Russia had this capability with its Progress cargo module. Nervousness over a single source was sufficient to drive both Europe and the United States to develop their own indigenous cargo capability. In fact, it was this drive toward an indigenous capability that gave birth to NASA’s Commercial Orbital Transportation Services (COTS) program, which provided the market that allowed SpaceX to develop at all. Owning such a capability means that China has acquired yet another capability deemed essential by other spacefaring powers to maintain human presence in space. While this certainly establishes China’s independent capability to do what very few nations can, it is less important to see this in light of joining some club. What is more important is to understand that on China’s own roadmap to be able to maintain long-term human presence and create a supply chain for space resources, yet another domino has fallen. Western policy that imagines China is only re-creating capabilities matured during the Cold War has yet to awaken to the real challenge China is posing in methodically creating this supply chain. By focusing on the past, the West mistakenly imagines a space race while missing what is in fact a “gold rush” in space. This gold rush is determined by China’s quest for renewable energy, to include resources to be mined from asteroids, the moon, and SBSP, that will boost its long-term economic developmental goals. Dr. Namrata Goswami is a MINERVA Grantee of the Minerva Initiative awarded by the Office of the Secretary of Defense in the United States. She is also a Senior Analyst for Wikistrat. The views expressed here are solely her own.